It was Tuesday 2nd march 2010. I was following the as usual daily routine life. Snoozing alarm until the time reaches 6:45 am. Getting early in the morning (yeah 6:45 is kind of dawn for me), go through the weather condition, emails and other notification on my iPhone. Preparing morning tea and then struggle to reach office and join the meeting @ 8:30. That day was almost same like other day. I kept on using internet on my iPhone unaware of that something bizarre is waiting for me. I did my work at the office moved back for home. It was raining cats and dog and chilling like anything. I was totally fed up and praying that when these all will stop. Well, on my way back to home I did some chatting on Gtalk, surf the news, replied to my mails and so on. Finally I reached my apartment. I was not checking my mail box since past 2-3 days so ended up doing so. There were some letters hiding in the dark and desperately waiting for me. I took them out and walked to the lift. I tear some of them, out of which one was from Softbank (The mobile carrier in Japan). Oops, I missed something. First let me take you in the past. 15 days back I broke up my previous mobile contract and switched to new contract. 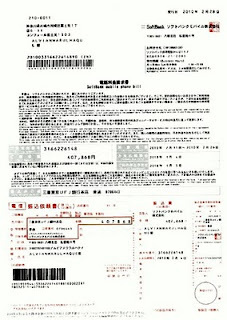 After cancelation I was expecting to pay around 40k+someting yen for old contract. I purchased a new smashing smart tiny Samsung mobile phone. But who care about other handset once you are addicted to the iPhone. So I pulled out the SIM card from Samsung and start using it on my iPhone. Mobile with internet facility seems to be a very costly affair in Japan unless you are using the unlimited data package plan. I used unlimited data package plan in my previous contract and paid 6200 yen per month at max. Now in same way started using data in my iPhone with new SIM card. I assume the same rule, as in India we are not bound by the carrier to use any specific hand set for GSM SIM card. Now let’s come back to the mobile bill from Softbank. Here comes the pain. The bill was of 4 lakh + something yen (Check the image). In Indian currency it will be around 2 lakh rupees. Yes, 2 lakh rupees and it was only for 15 days other 7 days was also expected. I thought they did some typo error and this is my last contract mobile bill of 40 k yen but at the other end I was totally scared too. So I called the customer care. They checked my record and the response was “Sir, this bill is for your current usage of data package and nothing to do with your old mobile contract”. Right away I spilled 2 word from my mouth “ Ohh Goddd”. I replied, if I’ve chosen unlimited data package plan then how it is possible? The response was “sir during all this period you have not used the handset given by Softbank and hence no discount plan is applicable for you. Right away it told her, if this was the case why I have not been informed intermediately and we had a long conversation. Finally she said please stop using other hand set and use the one provided by us and I will take your case to my supervisor which will take another one week to resolve. The moment she said one week, I realized that this is going to be the longest week of my life. I was in full depression and mental stress because if thing doesn’t go well I have to pay 3 lakh rupees for 21 days mobile bill. It was more than my last annual package. Due to depression, I just did what I usually do. I called all around the planet talk to some people and tried to release the stress. The whole talking scenario was ended later mid night that day. Second day I changed my SIM card to authorize it to use in my iPhone and at the same time I kept on talking to customer care almost every alternative day. Every time response was identical, we cannot say anything before 1 week. Finally it was 7th day. I called Softbank. I’ve been told that I will get a call related to the case today. Later that day I got the call and it was ended in between due to lost signal. The information was still not apparent to me. Now it was my turn to call them back, and finally with god’s grace the answer was in my favor. I just have to pay 6200 yen as per the unlimited data package plan. But believe me it was the most unanticipated week for me. So many things happened to me, when I say so many I mean seriously a lot of thing happened to me. Step by step things are getting better now. I am quite released and happy now.